★ QUALITY- The Clippers are produced to the quality standards demanded by professional dog groomers. ★ EASE OF USE- Uniquely designed to ensure perfect results when used by anyone, even first timers. ★ SAFE- Clippers have an integrated safety stop, which serves as a quick sensor. ★ SHARP- Designed with a heavy-duty 3.5-mm stainless steel blade to cut through nails cleanly and easily with just one squeeze. ★ PROFESSIONAL EVEN CUT- sharpness ensures that you never do uneven cuts that can lead to breakage. ★ QUICK & CLEAN- sharpness enables you to trim all of your dogs nails cleanly & quickly. So you won't accidentally slip and harm your dog during trimming. STAINLESS STEEL PET NAIL TRIMMER WITH QUICK SAFETY GUARD: Sturdy stainless steel trimmers are built to last and feature a quick safety guard for safe, painless, smooth cutting of claws and nails. EASY TO USE ERGONOMIC COMFORT GRIP HANDLE: Dog clippers feature an ergonomic, no slip, extra long handle for maximum control, grip, and comfort even for pet owners with small hands. 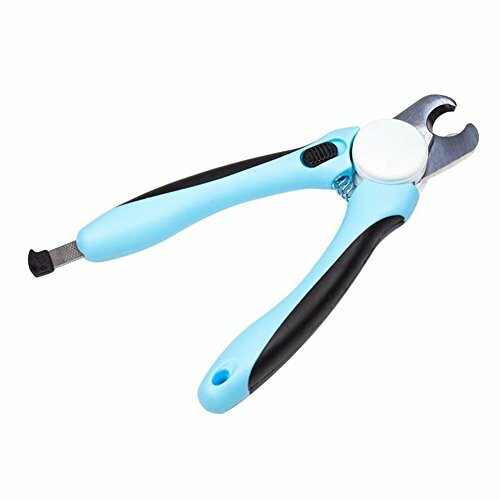 HIGHEST QUALITY PROFESSIONAL DOG NAIL CLIPPERS: Professional pet groomer strength dog nail clippers for safe and easy nail trimming for small & large breed dogs. Pro pooch pedicures made easy at home. SHARP AND DURABLE PET GROOMING TOOL: Hmcity sharp stainless steel scissor blade is guaranteed last and features a refined razor edge to cut straight through nails with surprisingly little pressure. CUSTOMER SATISFACTION GUARANTEED: Each of our dog nail clippers comes with a no questions asked satisfaction guarantee. If at anytime you are unhappy with your clippers return them for a full refund.